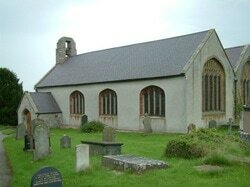 This is the only church dedicated to St Cynhafal, the site probably dating back to the 7th century. The present "double naved" building dates from the 15th century and has many interesting features including the carved heads and angels on the beams and the pelican in her piety above the altar symbolising Christ nourishing His church with His own blood. St Cynhafal's maintains the atmosphere of a place where "prayer has been valid" for many centuries. If you would like to experience this place of prayer for yourself, the key is readily available nearby.